A: 24 (at the time the video was recorded). Q: What city was Ksenia born in? Q: Did she win the contest? A: She won semi-finals with this performance, and then proceeded to win the finals (and the whole contest) with this one. Q: I want to see more of her work! Q: Why do people cry? A: It's rather hard to explain to a person who's country has never been invaded. Consider one simple fact: nearly every single person in that audience has lost a relative (whether close or distant) in that war. Try looking at the recap of the events depicted, provided below -- maybe it will help? Q: Can somebody annotate the events in the video? 0:00-1:30: A peaceful evening somewhere in the eastern USSR (whether Ukraine, Russia or Belorussia, it's not clear from the picture). He and she are sitting in the city park, a large Christian Orthodox church can be seen in the distance. 1:30-2:00: A lightpole-mounted radio speaker appears and announces German invasion into the USSR (June 22nd, 1941), German bombers appear in the air. She's scared and crying. A patriotic song calling all citizens to arms is played, and her mate obvuiosly heads out to protect the Motherland. 2:00-2:20: Troops are marching out of town, boarding trains and heading out to the frontlines. 2:20-3:05: The kid is born and she takes care of him during the long nights; her tears disappear, replaced with a loving smile. 3:35-3:40: Not quite clear. Could either mean that she and her kid end up under German air raid facing the scary turnmoil, but escape alive. Or, it could represent him battling with the enemies (in the wartime propaganda pictures, German Nazi were often depicted with those ugly pointy noses). 3:40-4:10: She receives a letter from the frontlines. Could it be from him? She's hopeful. 4:10-4:40: The letter announces that he's dead. The harsh news turn the beautiful girl into a sorrowful old lady. 4:50-5:05: His grave. Some people in the comments claimed that it's a Monument to Unknown Soldier. The confusion is understandable, given that these monuments were made to resemble the soldier graves (only scaled up). In other countries, it is common to mark their fallen by crosses; in the USSR, it used to be a wooden or metal pyramid (obelisk) crowned by a star. I am unable to find a photo of one from 1940's, but here's a more recent one to give you a general idea. See also this and this (frames from a movie). 5:05-5:30: We can see an old lady mourning him; I would assume it's his mother. Soon she's joined by our girl and their little son. 5:30-6:40: A citi razed to the ground by the war is slowly rebuilt. 7:10-7:40: She sees his image in the glass... In that image, he wears the Russian sailor's uniform so we can conclude he was a sailor. 8:10-END: Conclusion of the... movie? "You are forever beside us. 1945." Q: What did she spell out in the end? A: "Ты всегда рядом" (in Russian). Different translations are possible, the one I think is the best is "You are forever beside [me/us]"; can also be translated as "You are always near", "You are always close", "You are always next to [me/us]", etc. Q: What does 1945 mean? A: The year when World War II (or, more precisely, the Great Patriotic War which is relevant for the USSR/Russia/Ukraine) has ended. This number has a very special meaning for Soviet people/Russians/Ukrainians, a reminder of a great victory earned in great struggle, at the cost of great losses. Q: The opening music? (@ 0:00)? Q: What does the radio announcement @ 1:40 say? A: This is the actual historical broadcast making citizens of the Soviet Union/Ukraine/Russia aware of the German invasion on June 22nd 1941. See the original recording. Q: What is the jingle precluding the radio announcement (@ 1:27)? A: It is a Soviet-era radio jingle that precluded newscasts since 1939. It's the first few chords of "Широка страна моя родная" ("Broad My Dear Country Is") -- listen to the full song on YouTube, read Wikipedia article (in Russian, use Google translate to read if you want). The MP3 of the jingle itself can be downloaded here. Q: What is the song @ 1:45 playing along with the radio announcement? 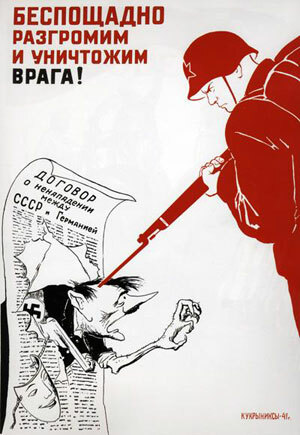 A: "Священная война" ("The Sacred War"), an inspirational song written in 1941 shortly after the German invasion of the USSR; it has been later famously performed by the A.V. Alexandrov's Red Army Choir. Read more about it on Wikipedia. Watch video on YouTube. Sovmusic.ru has it as an MP3 file. Q: What is the song @ 2:25? Q: I was wondering who the artist is that plays the intense music at 3:19 into the video. Q: I want to know te name of that AMAZING music in 3:41 till 5:05? Q: Anybody know what the song at 5:07 is called? Into the cranes of color snow-white. And we fall silent, gazing at the sky. And I can see that there is a gap amongst them. There will be day -- and maybe it is close. Same call for those of you I left below. Q: 6:10 till the end? Q: I want to download this video for a keepsake. Q: I have a question, but it's not listed above. A: Send an email to: youtube@wesha.name -- I will try to answer it and add to this FAQ.